Almost 25 years after the fact, Diego Rivera writes his own version of the controversy over the Rockefeller Center mural. When Nelson Rockefeller decided to decorate the main floor of his new R.C.A. Building in Radio City with murals, he also decided to get the best artists for the job. His choices were Picasso, Matisse, and myself. But he set about securing our services in the worst possible way. Through the architect of the building, Raymond Hood, he asked us to submit sample murals. Now, there are few indignities that can be thrown in the face of an established painter greater than to offer him a commission on terms which imply any doubts as to his abilities. But the invitations went further, they specified how the sample murals were to be done. Picasso flatly refused. As for Matisse, he politely but firmly replied that the specifications did not accord with his style of painting. I answered Hood that I was frankly baffled by this unorthodox way of dealing with me and could only say no. Having thus quickly lost Picasso and Matisse, Rockefeller determined that at the very least he would have me. In May 1932, he entered into the negotiations directly, since, on many matters, Hood and I could not see eye to eye. Hood's idea of a mural was typically American: a mural was a mere accessory, an ornament. He could not understand that its function was to extend the dimensions of the architecture. Hood wanted me to work in a funereal black, white and gray rather than in color, and on canvas rather than in fresco. Our differences piled up when I heard that two inferior painters, Frank Brangwyn and José María Sert, had been given the walls previously offered to Picasso and Matisse, walls that flanked the one offered me. Amid this difference and tension, Rockefeller moved with the calm of the practiced politician. He refused to be ruffled. By the fall of the year, he had persuaded Hood to let me work in fresco and in color, and we had agreed on the terms. For the sum of $21,000 for myself and my assistants, I was to cover slightly more than one thousand square feet of wall. The theme offered me was an exciting one: "Man at the Crossroads Looking with Hope and High Vision to the Choosing of a New and Better Future." After the complicated preliminaries, I entered into my assignment with enthusiasm. By the beginning of November, I had completed my preliminary sketches, submitted them, and received prompt and unqualified approval from Rockefeller. In March of 1933, Frida [Kahlo] and I arrived in New York from Detroit, greeted by the icy blasts of the New York winter. I set to work immediately. My wall, standing high above the elevators which faced the main entrance of the building, had already been prepared by my assistants, the scaffold erected, the full-scale sketches traced and stenciled on the wet surface, the colors ground. I painted rapidly and easily. Everything was going smoothly -- perhaps too smoothly. 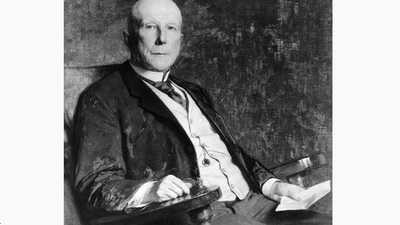 Rockefeller had not yet seen me or my work, but in the beginning of April, he wrote me that he had seen a photograph of the fresco in one of the newspapers and was enthusiastic about what I was doing. He hoped that I would be finished by the first of May, when the building was to be officially opened to the public. The center of my mural showed a worker at the controls of a large machine. In front of him, emerging from space, was a large hand holding a globe on which the dynamics of chemistry and biology, the recombination of atoms, and the division of a cell, were represented schematically. Two elongated ellipses crossed and met in the figure of the worker, one showing the wonders of the telescope and its revelation of bodies in space; the other showing the microscope and its discoveries -- cells, germs, bacteria, and delicate tissues. Above the germinating soil at the bottom, I projected two visions of civilization. On the left of the crossed ellipses, I showed a night-club scene of the debauched rich, a battlefield with men in the holocaust of war, and unemployed workers in a demonstration being clubbed by the police. On the right, I painted corresponding scenes of life in a socialist country: a May Day demonstration of marching, singing workers; an athletic stadium filled with girls exercising their bodies; and a figure of Lenin, symbolically clasping the hands of a black American and a white Russian soldier and workers, as allies of the future. A newspaper reporter for a New York afternoon paper came to interview me about my work, then nearing completion. He was particularly struck by this last scene and asked me for an explanation. I said that, as long as the Soviet Union was in existence, Nazi fascism could never be sure of its survival. Therefore, the Soviet Union must expect to be attacked by this reactionary enemy. If the United States wished to preserve its democratic forms, it would ally itself with Russia against fascism. Since Lenin was the pre-eminent founder of the Soviet Union and also the first and most altruistic theorist of modern communism, I used him as the center of the inevitable alliance between the Russian and the American. In doing this, I said, I was quite aware that I was going against public opinion. Having heard me out, the reporter, smiling politely, remarked that, apart from being a remarkable painter, I was also an excellent humorist. The following day the reporter's story appeared in his paper, The World Telegram. It told what should have surprised nobody, least of all Nelson Rockefeller, who was fully acquainted not only with my past and my political ideas but with my actual plans and sketches: that I was painting a revolutionary mural. However, the story suggested that I had boxed my patron, Rockefeller, which was, of course, not true. Thus the storm broke. I, who had become inured to storms, only painted on with greater speed. The first of May had passed, and I was nearly finished when I received a letter from Nelson Rockefeller requesting me to paint out the face of Lenin and substitute the face of an unknown man. Reasonable. However, one change might lead to demands for others. And hadn't every artist the right to use whatever models he wished in his painting? I gave the problem the most careful consideration. My assistants were all for a flat denial of the requests and threatened to strike if I yielded. 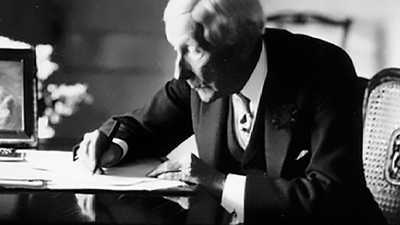 The reply I sent Rockefeller, two days after receiving his letter was, however, conciliatory in tone. To explain my refusal to paint out the head of Lenin, I pointed out that a figure of Lenin had appeared in my earliest sketches submitted to Raymond Hood. If anyone now objected to the appearance of this dead great man in my mural, such a person would, very likely, object to my entire concept. "Therefore," I wrote, never expecting that a presumably cultured man like Rockefeller would act upon my words so literally and so savagely, "rather than mutilate the conception, I should prefer the physical destruction of the conception in its entirety, but preserving, at least, its integrity." I suggested as a compromise that I replace the contrasting nightclub scene in the left half of the mural with the figure of Abraham Lincoln (symbolizing the reunification of the American states and the abolition of slavery), surrounded by John Brown, Nat Turner, William Lloyd Garrison, Wendell Phillips, and Harriet Beecher Stowe, or with a scientific figure like Cyrus McCormick, whose reaping machine had contributed to the victory of the Union forces by facilitating the harvesting of wheat in the fields depleted of men. As I awaited Rockefeller's response, the hours ticked by in silence. I was seized by a premonition that no further word would come, but that something terrible, instead, was about to happen. I summoned a photographer to take pictures of the almost finished mural, but the guards who had been ordered to admit no photographers, barred him. At last, one of my assistants, Lucienne Bloch, smuggled in a Leica, concealed in her bosom. Mounting the scaffold, she surreptitiously snapped as many pictures as she could without getting caught. On the day in the second week in May when Rockefeller finally made his move, the private police force of Radio City, reinforced the week before, was doubled. My assistants and I, aware that we were watched, that forces were being deployed as if for a military operation, worked on, pretending to ourselves that nothing was happening, or nothing as bad as we feared. But at dinnertime, when our numbers were at their smallest, three files of men surrounded my scaffold. Behind them appeared a representative of the firm of Todd, Robertson and Todd, managing agents for John D. Rockefeller Jr. Like a victorious commander, he asked me to come down for a parley. My assistants present at this dark moment, Ben Shahn, Hideo Noda, Lou Block, Lucienne Bloch, Sánchez Flores, and Arthur Niedendorff, looked at me helplessly. Helplessly, I let myself be ushered into the working shack, the telephone of which had been cut off, acknowledged the order to stop work, and received my check. Other men, meanwhile, removed my scaffold and replaced it with smaller ones, from which they affixed canvas frames covering the entire wall. Other men closed off the entrance with thick curtaining. As I left the building, I heard airplanes roaring overhead. Mounted policemen patrolled the streets. And then one of the very scenes I had depicted in my mural materialized before my eyes. A demonstration of workers began to form; the policemen charged, the workers dispersed; and the back of a seven-year-old girl, whose little legs could not carry her to safety in time, was injured by the blow of a club. One last thing remained. In February of 1934, after I had returned to Mexico, my Radio City mural was smashed to pieces from the wall. Thus was a great victory won over a portrait of Lenin; thus was free expression honored in America. One result of the fracas was the cancellation of my General Motors assignment, and I was cut off from commissions to paint in the United States for a long time. Rockefeller, wishing to avoid further bad publicity or the nuisance of a court action, had paid me my entire fee. Out of the $21,000, however, $6,300 went to Mrs. Paine as her agent's commission; about $8,000 covered the cost of materials and the wages of assistants; and I was left with somewhat less than $7,000. Considering the loss of present and future commissions, I was advised by my attorney to sue Rockefeller for $250,000 for damages and indemnification. However, I did not sue; a legal action would have tended to nullify my position. Rockefeller's action in covering the mural -- with canvas frames and later with strips of sheath paper -- became a cause célèbre. Sides were drawn. A group of conservative artists calling themselves the Advance American Art Commission exploited the occasion to condemn the hiring of foreign painters in the United States. In contrast to these chauvinistic second-raters, who would have substituted a national-origin standard for that of artistic excellence, and who applauded Rockefeller's act of vandalism, another group of artists, writers, and intellectuals, including Walter Pach, George Biddle, Bruce Bliven, Robert L. Cantwell, Lewis Gannett, Rockwell Kent, H.L. 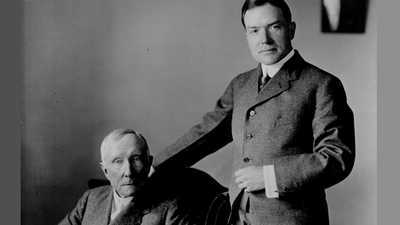 Mencken, Lewis Mumford, Waldo Pierce, and Boardman Robinson, besought Rockefeller to reconsider what he had done. It was largely because of such protests that Rockefeller waited nearly a year before he destroyed my mural. Two days after it had been covered over, Raymond Hood announced that it would receive "very careful handling." At the worst, two possibilities were suggested as its fate: that it might temporarily be screened with a canvas mural; or that it might be removed, plaster and all, for preservation elsewhere. Oddly enough, Communist leaders such as Robert Minor, Sidney Bloomfield, and my old friend Joe Freeman, editor of the New Masses, denounced the work as "reactionary" and "counterrevolutionary" and condemned me for having betrayed the masses by painting in capitalistic buildings! In the spring of 1933, I aired my views over a small radio station in New York. 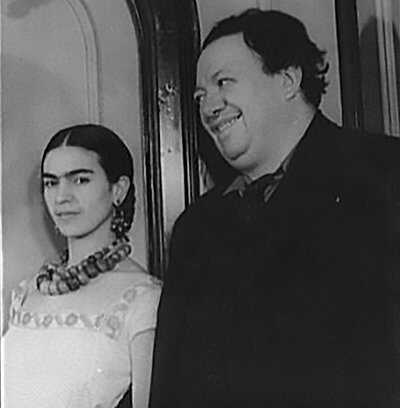 "The case of Diego Rivera is a small matter. I want to explain more clearly the principles involved. Let us take, as an example, an American millionaire who buys the Sistine Chapel, which contains the work of Michelangelo … Would that millionaire have the right to destroy the Sistine Chapel? "Let us suppose that another millionaire should buy the unpublished manuscripts in which a scientist like Einstein had left the key to his mathematical theories. Would that millionaire have the right to burn those manuscripts? … In human creation there is something which belongs to humanity at large, and … no individual owner has the right to destroy it or keep solely for his own enjoyment."